This painting was based on a photograph I took while we were doing our Winter Skills course at Glenmore Lodge. We’d been taken into Coire an t’Sneachda to learn about survival skills, digging snow holes etc and it really was a spectacular location. On Wednesday I was stood at the top of this amazing coire looking down to where we’d been in the snow a good few years ago. It was still as spectacular but with much less snow. Amazingly though, for mid July and very warm conditions, there was a surprisingly large amount of snow patches to be found still. 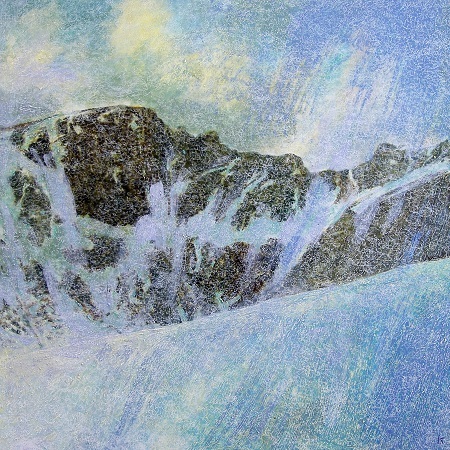 I may have to do another painting of Coire an t’Sneachda ….this time from the top and in summer conditions. >> Next Post: Pucks Glen – a short walk…..or an adventure? !